Execution nodes are a context to register ksessions and kbases against for lookup. A Knowledge Base has a 0..n resources. Has two nested elements, resources and configurations. Those resources can be inner elements or references, using the "ref" attribute. drools-spring allows for grouping of listeners. This is particularly useful when you define a set of listeners and want to attach them to multiple sessions. The grouping feature is also very useful, when we define a set of listeners for 'testing' and then want to switch them for 'production' use. This chapter describes the infrastructure used when configuring a human task server with Spring as well as a little bit about the infrastructure used when doing this. The jBPM human task server can be configured to use Spring persistence. Example 2.11, “Configuring Human Task with Spring” is an example of this which uses local transactions and Spring's thread-safe EntityManager proxy. The following diagram shows the dependency graph used in Example 2.11, “Configuring Human Task with Spring”. A TaskService instance is dependent on two other bean types: a drools SystemEventListener bean as well as a TaskSessionSpringFactoryImpl bean. The TaskSessionSpringFactoryImpl bean is howerver not injected into the TaskService bean because this would cause a circular dependency. To solve this problem, when the TaskService bean is injected into the TaskSessionSpringFactoryImpl bean, the setter method used secretly injects the TaskSessionSpringFactoryImpl instance back into the TaskService bean and initializes the TaskService bean as well. The TaskSessionSpringFactoryImpl bean is responsible for creating all the internal instances in human task that deal with transactions and persistence context management. Besides a TaskService instance, this bean also requires a transaction manager and a persistence context to be injected. Specifically, it requires an instance of a HumanTaskSpringTransactionManager bean (as a transaction manager) and an instance of a SharedEntityManagerBean bean (as a persistence context instance). We also use some of the standard Spring beans in order to configure persistence: there's a bean to hold the EntityManagerFactory instance as well as the SharedEntityManagerBean instance. The SharedEntityManagerBean provides a shared, thread-safe proxy for the actual EntityManager. 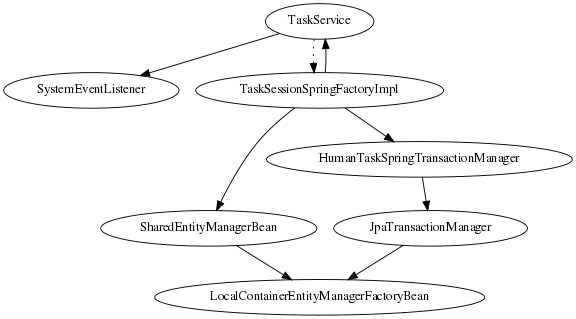 The HumanTaskSpringTransactionManager bean serves as a wrapper around the Spring transaction manager, in this case the JpaTransactionManager. An instance of a JpaTransactionManager bean is also instantiated because of this. When using the SharedEntityManagerBean instance, it's important to configure the Spring transaction manager to use nested transactions. This is because the SharedEntityManagerBean is a transactional persistence context and will close the persistence context after every operation. However, the human task server needs to be able to access (persisted) entities after operations. Nested transactions allow us to still have access to entities that otherwise would have been detached and are no longer accessible, especially when using an ORM framework that uses lazy-initialization of entities. Also, while the TaskSessionSpringFactoryImpl bean takes an “useJTA” parameter, at the moment, JTA transactions with Spring have not yet been fully tested.